On a small peninsula in North Dalmatia, town of Biograd is located. Once a royal Croatian town where noblemen resided, today this Dalmatian town is one of the leading tourist and nautical centers in Croatia. Biograd was one of the first places in Croatia where tourism industry started so it is no wonder it has gained such huge popularity among people who visit our country. On a small area of the peninsula there is an old town center that has several valuable buildings and monuments from early medieval times and later periods. On one side of the town we can find beautiful Biograd beaches and pine forest, while on the other there is a large marina with many berths. Apart from summer fiestas and concerts of numerous music stars, Biograd is also a place where other events are being held, such as Biograd Boat Show, the biggest boat show in Croatia and region, or Gastro Biograd, a gastronomy festival where one can taste the finest dishes of Biograd and Croatian cuisine, with excellent music in the background. Zadar is the fifth largest city in Croatia, and it is also an administrative and economic centre of North Dalmatia. Besides that status, Zadar is also a tourist destination whose popularity has grown with each new year so it is no wonder that it was proclaimed as the best European tourist destination in 2016. This town has a long history that spans over two millenia. It originated on a peninsula where Romans established a colony for their retired soldiers and gave them land. The town has been growing and developing ever since and it gained more significance in the Middle Ages and later periods. Zadar today is a very pleasant place, whose stone streets and buildings serve as an open museum. Mediterranean way of life and excellent food can be enjoyed at various restaurants and bars in the town centre. Must-visit sites are St. Donatus church and St. Anastasia cathedral, but be sure not to miss modern attractions as well: unique Sea Organ and Greetings to the Sun installation. Šibenik is located in the central part of Dalmatia, halfway between Split and Zadar and it is one of the rare towns founded by Croats, without any previous settlement being on that location. That is why Šibenik center stands out : while it may not have regular Roman raster, it still has charming streets meandering up the hill and creating and organic urban structure of a charming Mediterranean town. Throughout the history, Šibenik has had many artists and produced valuable monuments, such as the masterpiece od Romanesque and Gothic architecture, St. James cathedral, which was designed and decorated with sculptures by Juraj Dalmatinac. Another attraction of Šibenik are its fortresses that have recently been renovated. Two of them, Barone and St. Michael fortress serve as concert and event venues. Šibenik is known as a town of excellent musicians, and that's why it doesn't come as a surprise that many famous Croatian singers, as well as the famous foreign ones, choose to perform there. We must also mention that Šibenik hosts renowned International Children's Festival that has been held there since 1958. Kornati archipelago is located in the maritime area between Zadar and Šibenik. It comprises more than a hundred islands, islets and rocks and it is an ideal location for a boat trip. Beautiful scenes of the islands that look like numerous stone pearls scattered over the deep blue sea surface will leave everyone breathless. Kornati archipelago was named after its biggest island, Kornat. The island is not permanently settled but it still has several interesting sites worth visiting, such as the remains of Tureta Byzantine fortress and early Christian basilica with three naves, then Magazinova škrila landscape which had been formed when some time in the past an earthquake struck this area and a large amount of limestone slid into the sea, leaving behind a flat plateau that resembles man made structures. Other natural attractions are so called Kornati crowns, i. e. steep rocks on the outer parts of the islands that dive into the sea, and exceptionally interesting and diverse sea bed which is a paradise for all scuba divers. Meandering through the karst landscape of Šibenik hinterland on its way to the sea, Krka river forms one of the most beautiful sceneries in the country, a reason why almost entire flow of the river was declared a National park. Lush river vegetation makes an interesting contrast with steep rocky hills that are covered in scattered Mediterranean plants, and due to the tufa barriers that had developed on several locations along the river, wonderful waterfalls were formed. The most famous waterfall is Skradinski buk, near which it is possible to swim during the summer months. There is also Roški slap waterfall, Ogrlice and many more that make you visit this Park several times in order to fully enjoy its beauties. There are many monuments in the Park area, such as the Franciscan monastery of Visovac, located on the islet that bears the same name, Krka monastery and the remains of Burnum, Roman military camp with a small archaeological collection on display in a nearby village and a well preserved amphitheatre. Another structures reminds us about the importance of this area in the past: there are several towers whose remains can be visible on the cliffs above the river that served for monitoring and controlling the river and its surroundings. Amidst the rocky slopes of Velebit mountain covered in forest that descend toward the sea and overlook Kvarner islands and Zadar hinterland, Paklenica National Park is situated. Its area includes the canyons of Mala and Velika Paklenica, forests, numerous „kukovi“ – rocks that stand out with their interesting morphology, and the most famous one is Anića kuk, very popular destination for all free climbers and since the Park has a network of hiking trails it is an excellent choice for exploring Croatian mountains. There is a mountain hut and several mountain shelters in the Park. Besides beautiful nature, Paklenica has another attraction that can be visited: an underground bunker system that was built during the fifties in the last century as a shelter for the government and president od the former state in case of an attack. The entire complex has been renovated and turned into a modern center for visitors, it has a multimedia room, a bar, souvenir shop, info center and a climbing wall. Regarding some older attractions, it is worth seeing „mirila“, stone monuments of the late persons that are scattered all over Velebit, and which were considered even more important than the actual graves by the local people since they believed that the late person's soul remained at the „mirilo“. Plitvice Lakes National Park is the oldest one in Croatia and it is situated in the heart of Lika, Croatian mountain region, surrounded by mountain slopes and unspoilt nature and it is under UNESCO protection as a part of world natural heritage. Sixteen emerald green and blue lakes line one after another cascading down the dolomite and limestone slopes covered in forest. The lakes were formed when the tufa barriers started developing, and they are connected through numerous waterfalls and streams that flow from one into another. Water is supplied by nearby rivers and streams, and the most famous „water“ attraction is Veliki slap, the highest waterfall in Croatia measuring 78 meters. Lake shores are bordered with wooden paths and trails so the lakes can be seen on foot. Trip to the lakes also includes a boat ride on one of them. There are also several caves in the area of the Park, and two of them are open for visitors, Golubnjača and Šupljara. If you prefer floral wonders, Plitvice Lakes are the right destination for you as there are more than fifty orchid species growing amidst the forest vegetation of the Park. Vransko Lake is situated right next to the Adriatic shore, separated from the sea by a thin land strip with Pakoštane and Drage settlements. This lake is the largest fresh water lake in Croatia. Its interesting location near the sea, combined with the vegetation and animal world of the lake, creates very attractive landscape full of contrast and beauty. Vransko Lake is also a habitat for numerous swamp bird species, which is the reason why a portion of the lake and its surrounding area has been declared an ornithological reserve. The reserve has a beautiful wooden path with lookouts made for birdwatching. There are also several cycling and hiking paths that stretch along the entire lake. There is a lookout situated at Kamenjak hill on the north side, where one can enjoy beautiful view of the lake, sea shore and nearby islands. There is also an info center and a small harbour located at the beginning of Prosika, a man made channel that connects the lake with the Adriatic sea. Other places that must be visited are Maškovića han, the westernmost example of Ottoman secular architecture, the old town of Vrana and the remains of a Benedictine monastery. Telašćica Nature Park is situated on the island of Dugi otok, and it includes Telašćica bay, the largest and safest natural harbour on the Croatian part of the Adriatic. The bay itself consists of many coves and smaller bays. 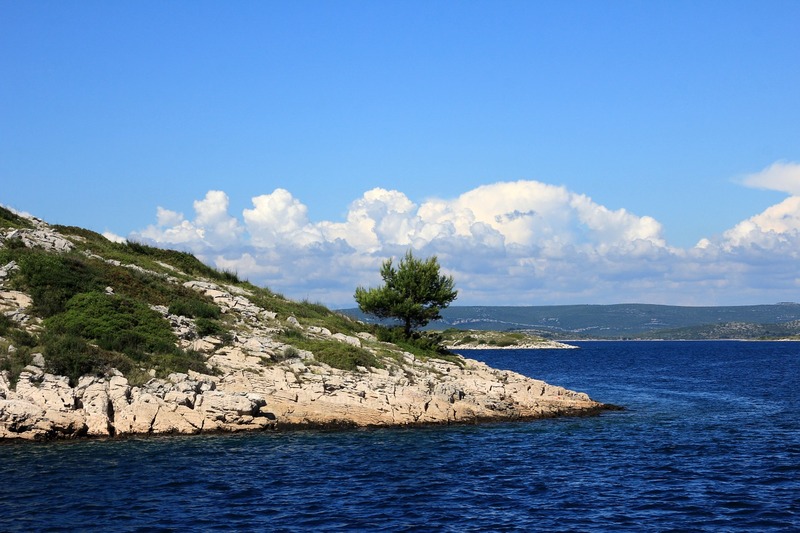 It also includes six islets, the most interesting one being Taljurić as its flat shape resembles a plate. The outer part of the bay, the one that faces open sea, is famous for its cliffs as these vertical rocks descend into the sea from the height of more than 180 meters . The Park also boasts with salt lake Mir (whose waters have higher salinity than those of the surrounding sea) and a donkey sanctuary where the visitors can spend some time with this lovely animals known for their stubborness and which are a symbol of Dalmatia.